This handsome armchair and ottoman set will bring an air of elegance and sophistication to your home. Furnish your living room with the comfortable chair ornamented with gorgeous traditional design details. 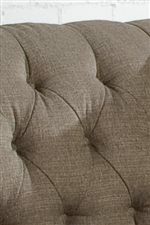 The matching ottoman is a perfect decorative accent and also a great place to put up your feet at the end of a long day. 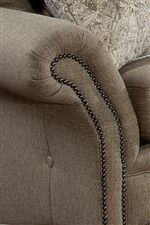 Design features include button tufted back, rolled arms, welt cords, nailhead trim, and turned feet. The exposed wood feet are finished in a complementing finish color. The 396 Traditional Button-Tufted Chair and Ottoman Combination by Smith Brothers at Mueller Furniture in the Lake St. Louis, Wentzville, O'Fallon, MO, St.Charles, St.Louis Area, MO Furniture Store and Belleville, Shiloh, O'Fallon,IL area. Product availability may vary. Contact us for the most current availability on this product. 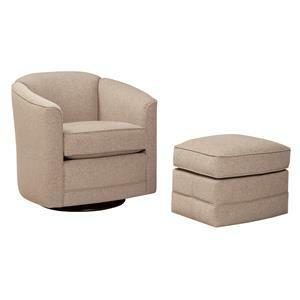 396-40 Ottoman 1 18" 25" 17"
396-30 Chair 1 38" 42" 36"